We had more heavy rain yesterday morning, much welcomed by us as the river is a touch lower than normal. The many streams feeding off the tundra coloured up adding peat to the water, at both Middle Camp and here at Lower we noticed the change in the water colour and we all felt it put the fish off in the afternoon. That said – it is all relative up here – Middle had 98 salmon to nine rods and at Lower the four fishers had 43. Not bad in slightly adverse conditions! Arnaud F-M led the way at Middle with 17 for the day. He has also kicked off our annual International Swimming Championships, taking two swims for France both of which required replacement life jacket gas canisters. Simon P had a paddle for the UK team with Hugh our Middle Camp manager, representing the Home Team, having a ‘bit of a dunk’ while exploring new water. Clarkes Corner was reported to be ‘stuffed’ with fish waiting to go up the Yovas Rapids, Patricia S had 10 salmon in the afternoon there. Four rods went above the rapids to Scotts in the morning catching 17, proving that the fish are now on their way upstream to Pana. At Lower there was some experimentation, Craig P tried a surface Bomber, on the limit with the water only at 6⁰C, he rose several fish, one of them three times, before changing back to a sub-surface fly to take them. Alan J stuck to his favourite Ally Shrimp and landed 9 from Janaways in the morning. Yellow and black, tied by Jesse. Deadly! ﻿The river came up an inch or so and remains at 6⁰C. Just on the cusp of floating line territory but not quite there yet. 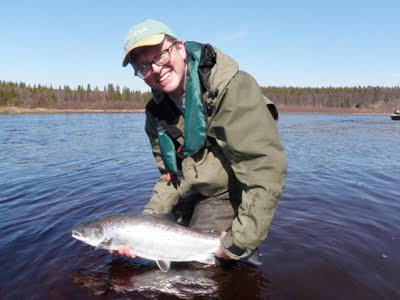 The most successful fishers are using sinking tips, a shortish leader and a fairly eclectic mix of flies ranging from the Green Highlander through the colour spectrum to black. The safe bets being Ally Shrimp, Cascade and Willy Gunn. 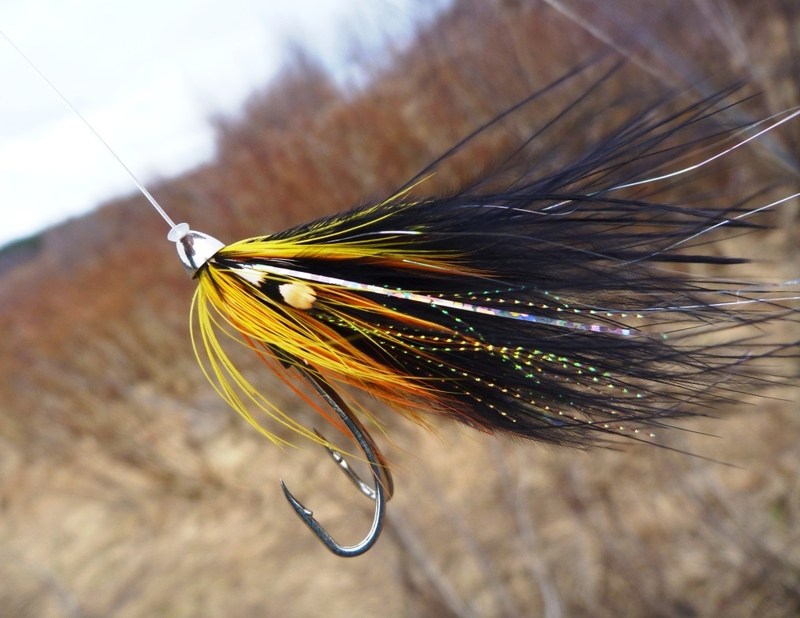 Jesse reccomends a yellow fly with contrasting black, ask him for one of his specials - tied with a cone head. Deadly! Great fishing so far – and only 4 days into the season.